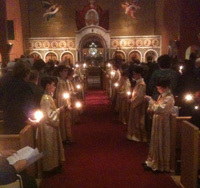 Young men ten years of age through high school assist the Priest at the altar during the Divine Liturgy and other Services. New acolytes are received into the group every fall following the completion of the annual Acolyte workshop. We have 3 groups of altar boys. Contact George Athanasiou, Director of Youth and Young Adult Ministries through our Church office.